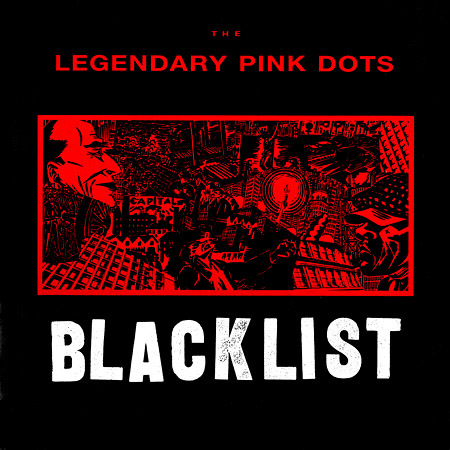 The Legendary Pink Dots, "Blacklist"
Produced by Hans Myer and the LPDs, engineered by Hans Myer. The track "Black Castles" is titled "Shiny, Shiny Black Castles" on the label of the LP editions and on the SPV cassette. They scorched the earth; they petrified the forest - painted windows black. Pumped cyanide in rivers, roamed around in packs ; screamed "STAND, DELIVER!" they always took it all. Resistance cracked, we'd hide, but sure they'd find us curled up on the floorboards of our shack. Five on the blacklist! Five on the blacklist! We were bubbling under, now we're in there, with a bullet (through the brain) Frightened on the floorboards of our shack, quite naked, once we'd fight them - now we take it all. They have our names, they have our numbers. the print-out says we take it all again and again untill we pay... Five on the blacklist! Five on the blacklist! We were bubbling under, now we're in there, with a bullet. FIVE ! Five on the blacklist! FOUR! Five on the blacklist! THREE! Five on the blacklist! TWO! Five on the blacklist! ONE ! Five on the blacklist! Sounding the bell in the corridor. Sweeping the floor with her hair. She sprinkles hot ashes and salt on the stairs as she walks. We all walk behind her. The city sleeps restless below ; one thousand dark stars flashing random. We swing on the wires, we lie in the road but the cars just fly by us - they dodge and drive on. We slide down the gutters. We hide with the rats in the catacombs. We swim through the eggshells and matchsticks and toothpicks - We retreat to the underworld, down where it's warm. Wherever our lady will lead us, wherever our lady will need us...It's heaven in hell and nothing will scare us, no nothing will scare me again. Wherever our lady will lead us, wherever our lady will need us...It's heaven in hell and nothing will scare us, no nothing will scare me again.